Whether you’re a professional or not, time is everything. It’s great that we now have timer apps that easily manage time. Recently, we had covered the best Apple Watch Timer Apps. Most of those apps offered a built-in tool for the timer. This time, however, we are focusing on timer apps for Mac in general. You will find options from categories like Task timer apps, Pomodoro Timer apps, Countdown timer apps etc. We have also included Reminder timers and some time-tracker timers for freelancers. First, we will have a look at some task timers. These apps allow you to list out all your tasks and allocate time for everything. Simply run the timer to get things moving. Activity Timer is a simple task timer app for Mac without any fully-fledged window. You can access the Activities and Timer sections from the menu-bar interface. Activity Timer lets you add multiple activities at once and run them individually. To run the app, you can choose between time presets (like 3, 5, 25 minutes) or make your own custom intervals. Once the timer starts, it shows the remaining time on the icon itself. At any time, you can pause/stop the activities or start a new one. There is a good amount of customization such as the sound played when a timer is done or a custom message when the timer has finished. Like most Mac Apps, Activity Timer has an iOS app as well. Activity Timer for Mac is a perfect choice if you love minimalism. It’s a simple app with both presets and custom-made timers. Like the first one, hr is an ultra-simple timer app for Mac. It too functions from the menu bar, which is great. Compared to Activity Timer, however, hr app offers a lot of features like Task categories and Tasks. You can use gestures to manage the to-do list-based activities list. Unlike most of the tools here, hr app offers multiple viewing modes, session management, and stats that are completely accurate. You can use the app for basic time-tracking needs as well. The best part is that you have a nice way to look at the to-do tasks. hr for Mac is probably the best timer app for managing and tracking tasks. The design is simple and you can customize almost every part of the program. Pomodoro is a time-management technique involving certain breaks at set times. To get started, you choose a task and then work on it for 25 minutes, next take 5 minutes break and again start the 25-minutes session. Once you have taken four 25-minutes sessions, take a long break. Here are the best Pomodoro apps for Mac. focus booster is an incredibly simpler Pomodoro timer app for Mac. However, despite the simple interface, focus booster lets you customize things like length of session, break duration etc. You can also sign into an account and sync time-tracking data between your macOS, iPhone, and Android. Nevertheless, we wished there was a menu-bar icon for the app. You will have to open the app to know how much time you have left. Also, focus booster does not let you add multiple tasks at once. On the bright side, you can have the better workflow, thanks to multi-platform apps. 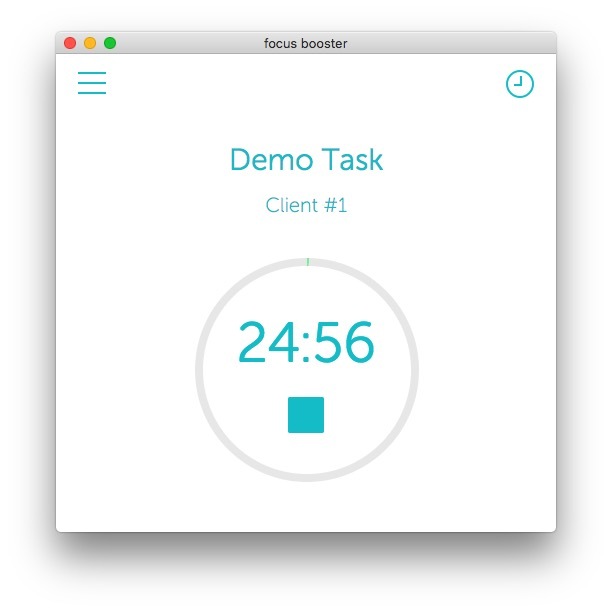 Overall, focus booster is the best choice if you need a simple Pomodoro timer with analytics. It’s useful when you have multiple clients and want to track time. Pomotodo, as the name suggests, combines an excellent Pomodoro timer and a task-management list. 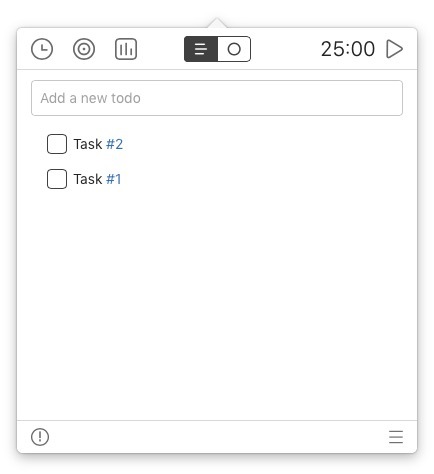 You can add tasks to the simple interface and also start the Pomodoro timer. However, both these things aren’t integrated i.e. you cannot run the timer for a specific task. However, when the timer is running, you can mark the tasks complete. Pomotodo has options like Analytics, Stats, Goals, and History. You can go to Preferences and customize the way this timer app works. In addition, Pomotodo also brings multi-device sync and a fully-fledged time management system. 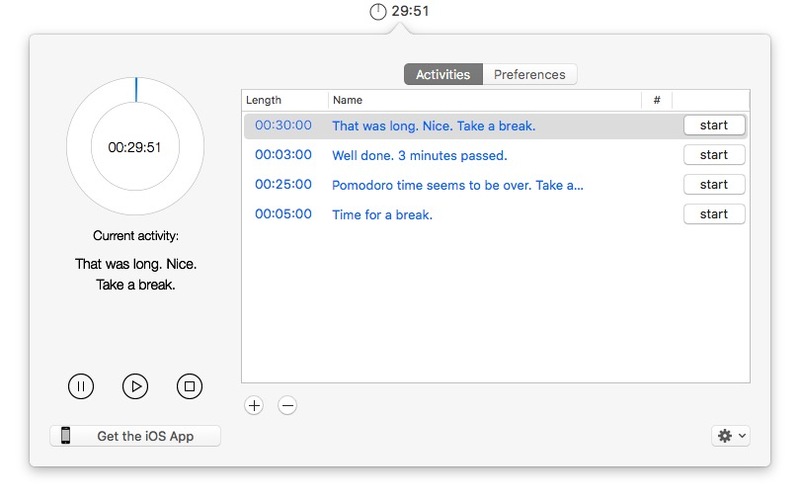 Pomotodo is more than a simple Mac timer app. 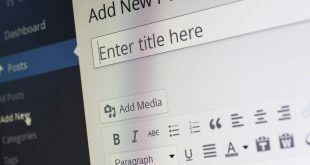 It offers ample options for time management as well as Pomodoro technique use. There are important things that you wait for. The following Mac timer apps will let you set a countdown and bring the visual impact. WaitingList does exactly what its name says. It lets you create amazing countdown timers that you can find in the menu bar. Just click on the WaitingList icon and there will be a list of things that you’re waiting for. As opposed to other apps, WaitingList prioritizes visual appeal over anything. The point is that you can create eye-pleasing countdowns easily. WaitingList lets you choose the style as well as the background. You can also get reminders about an approaching event. Last but not the least, the app offers iCloud Sync feature as well. WaitingList is an awesome choice when you need interactive timers and reminders. 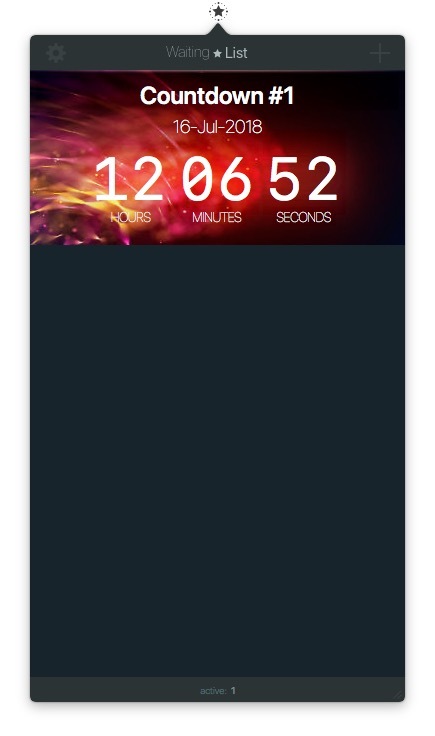 It’s a count-down app that makes your events look more exciting. 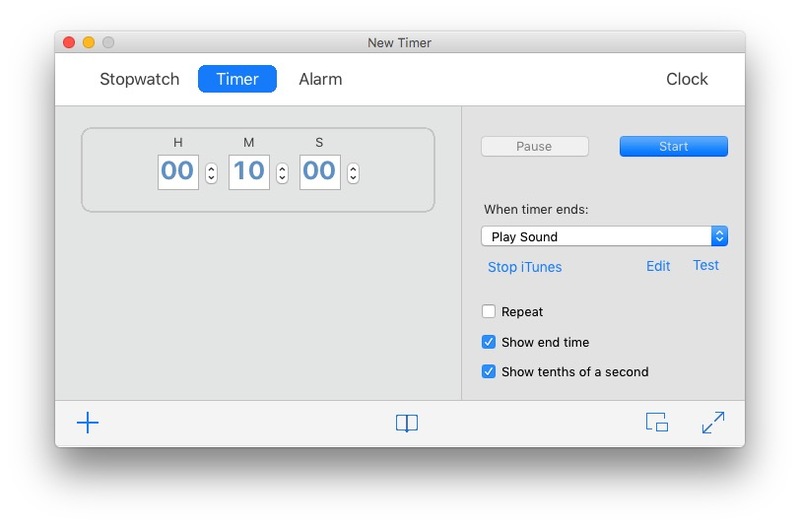 Timer for Mac is a general timer app but works awesome for almost all needs. You can use this app to set a stopwatch timer, normal timer or alarms. It also offers a section named Clock, where you can see the current time. In the free version, you can set reminders along with actions. It focuses on accuracy and ease of use, but an awesome set of features are also there. Going Pro, Timer for Mac can bring you full-screen mode, a better set of programmed actions etc. Timer for Mac does many jobs beautifully when you need to set a timer. That having said, you’d need the Pro version if you need some awesome features listed above. Do you want to be reminded at certain times? Or, for certain needs? You can count on the following apps to do that. It’s very important to take frequent breaks — for your health and productivity. Time Out for Mac allows you to run a timer to remind you. When it’s time for the break, Time Out will show you a full-screen message on the Mac screen. 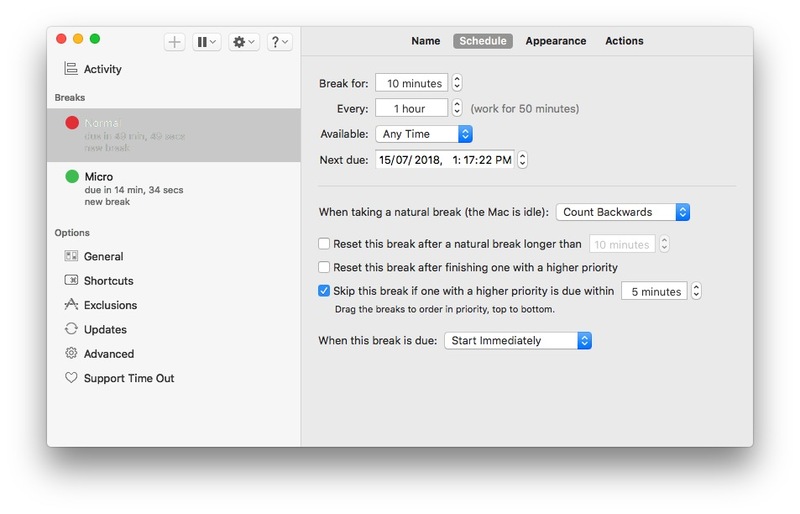 While setting up Time Out, you can decide the desired amount of breaks. You also get features like Micro Breaks and advanced scheduling. Customization is the key of this timer app. From the time to how take-a-break messages are shown, everything can be changed. Overall, Time Out is the best companion for those who spend hours in front of the PC. It lets you take a break without compromising productivity. Don’t forget to come back on time, though. 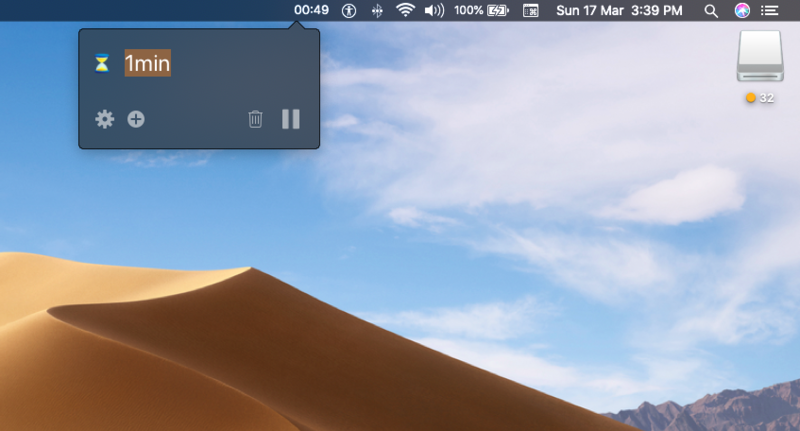 Stand for Mac is a wonderful Mac timer app for all users. It reminds you to stand up once in a while. The app does not come with any bells or whistles. Instead, you can decide how often you want to be notified about standing up. The idea of Stand for Mac is amazing indeed. The app does not have a fully-fledged window but Preferences are available from the icon menu. 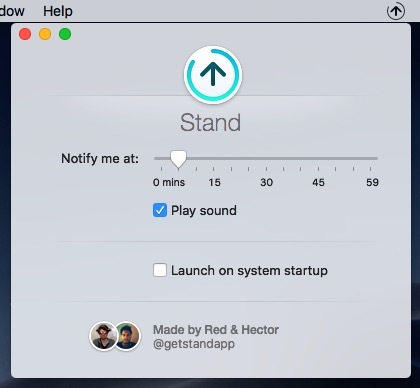 Stand for Mac also plays a sound when it’s time to stand up, but further customization isn’t available. The Verdict: If you think you have an unhealthy lifestyle of sitting all the time, use Stand for Mac. It comes at no cost, which is great. If you don’t want to buy a dedicated kitchen timer gadget, you can use this app. It’s one of the best cooking timers among the very few apps you’ll find. 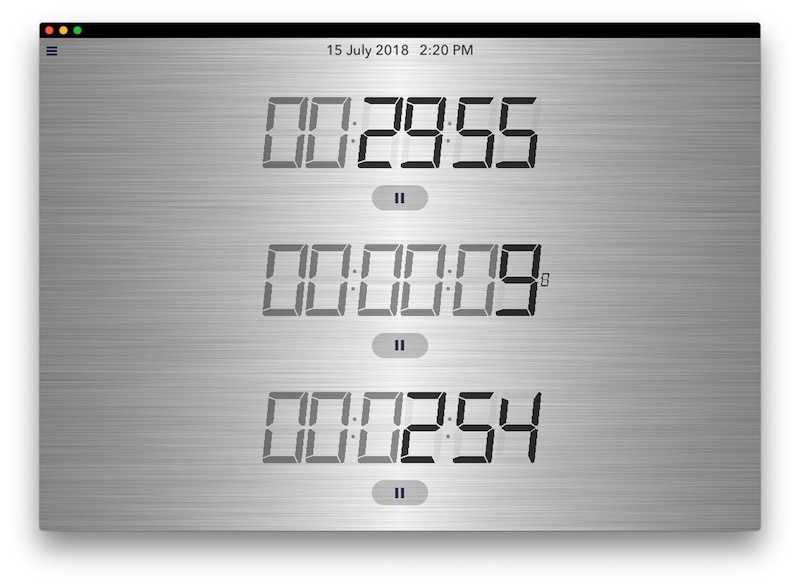 Cooking Timer is an awesome Mac timer app for chefs out there. It’s pretty simple to use if you’re into some BBQ events or some other cooking. Cooking Timer lets you run three timers at the same time. You can make use of them for different needs. Coming to the timers, you can use them as Stopwatches or timers itself. In the latter case, choose the desired length from the menu. The single-tap technique makes it easy to manage the timers so that you can focus on what’s being prepared. Cooking Timer is the simplest solution out there, for all the good reasons. You can use this timer without concerns when you want to focus on the cooking process. 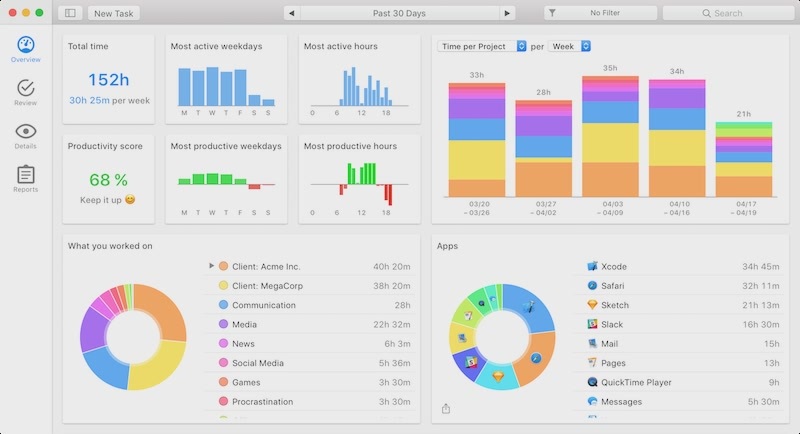 Here is an awesome app that you can use to track how much time you spend on Mac. If you are a freelancer, you can know how much team each project requires. Timing is a wonderful time-tracking app for Mac. Compared to the competitors, Timing is automated when it comes to actions. You don’t have to press the Start or Stop buttons. Instead, Timing app will observe and analyze where you are spending most of your time. At the end of the day, Timing provides a proper report of time consumption. If you are a professional, you can use this data to create invoices and reports. 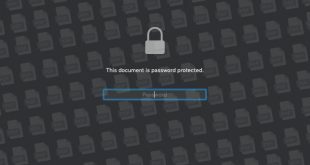 The best part is that you can automate this process too. It’s going to let you set up some rules for report generation. Timing for Mac is perhaps the best time-tracker for almost every freelancer. You cannot use the app for normal countdown or anything, but the time-tracking part is excellent. Yet another extremely minimal timer app that won’t even make you feel its presence. No extra features than the exact job it needs to execute. The app is available on the macOS App Store and takes a few seconds to get installed. The app is so light on the system that even summoning Siri to know weather updates might take more space on the RAM. Once installed, you’ll see the ‘hour glass’ shaped app icon on the menu bar. Click on the icon to reveal the tiny app interface wherein you just insert the time and press the play button. That’s it, the timer will start on the count-down display is visible on the menu bar. 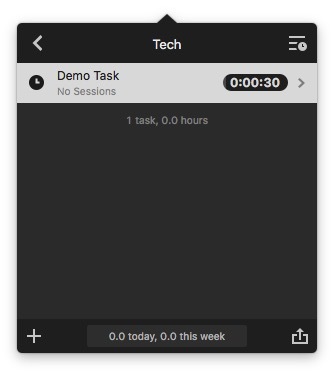 The good part about the app is that you can continue with other tasks while the timer would still be visible on the menu bar. And even if you work in full screen it had you covered. It plays a tone upon finishing. You can even change the tone and set a timer creation shortcut in premium version which doesn’t cost as much. 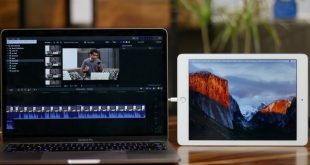 The 10 Mac timer apps we have covered are made for unique needs. As it happens, you cannot fulfill all your needs with a single app. For instance, hr, our pick for task management, would be less useful if you need to get reminders on time. In that case, you should go for something like Time Out. By the way, do let us know which tool do you use for timers and time-tracking.